I listened to this via The Quietus not long after it happened; only posting now because I’m posting it now. The reason I listened to her is because she also plays with Gnod. This is not much like Gnod, albeit exactly what are Gnod like? They are like many things. This put me in a trance, even though I was at work (that’s how I cope). I’ve just deleted several sentences where I tried to describe it. This is why I’ve given up trying to describe music using words. Even given my recent lack of words, this doesn’t need them. Another trip back to Brazil, completely unlike any of the previous visits. 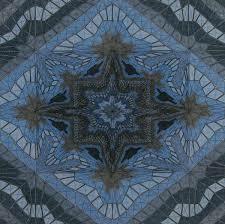 Yantra do what is described as psychedelic meditation music. From such a thing you can expect and will receive two slow-moving pieces of improvised performances which do that hypnotic transcendent thing of which I am so fond. These two pieces were recorded in 2016 at separate locations, and you can tell the difference in atmosphere of each piece. They do complement each other very well, however. Because I don’t often listen to pure drone works, I don’t really have any reference points for you. That probably isn’t important anyway. If you’re in the mood to chill, this works very well. The label that releases this seems very interesting, too. I had a listen to one of the Hierofante releases, and I’ll definitely be going back for another listen. So I mentioned that I’d been intending to cover a couple of albums from my historic listening, and here we are with one such. It occurred to me lately that when you listen to something is just as much a factor in how good you perceive it to be as the quality of the music itself, although the latter is of vital importance. The point I’m trying to make is that something that is really good might seem average if you’re listening in the wrong mood, and mood is very often time dependent as well as context dependent. For example, something that really works on a Sunday morning is not guaranteed to make the same spot resonate in the same way if you put it on Friday evening before going out somewhere. So, this is a good Sunday album, although it’s also a good late night album if you’re in a mellow mood. I also think it would be good for listening to at work; those spreadhseets ain’t much fun with library office gossip as a background noise. It’s a cross of middle eastern sounds – which I do have a regular soft spot for – with ambient production and atmospheres. It’s nowhere near as uptempo as her usual style, but I do like that too. The whole album is worth checking as it’s very chilled. What’s the definition of perfect pitch? A banjo down a 40-foot hole without touching the sides! At least, I used to think that was the pinnacle in musician jokes, but then the legendary Daniel Higgs had to go and start doing improvisations with a banjo, didn’t he? And now I like music with banjos in it. This sort of music could be made anywhere, anywhen. I’m sure I’ve heard Indian ragas with this kind of feel, I’ve definitely heard Hamza el-Din doing stuff with this kind of feel, and probably all the zillion or so other cultures in the world also have their equivalents. His previous band Lungfish did meditative and repetitive music, so you could argue his approach has been consistent all the way through. He’s done quite a few of this sort of thing solo, my other recent favourite being The Godward Way. The subject matter, when he does sing, is the perennial philosophy. This is the music of a man sitting down and letting the spirit move his fingers. I hesitate to use the word ‘shaman’ because it is a label that has been pinned on so many now and is probably a bit overused, and I’m also not overly confident that we use the term correctly anymore anyway. But, y’know, mystical and cosmic philosophies? Improvised meditative music? I’ll just make myself comfortable. The crowd goes wild and roars its affirmation. Their second album, Lunes, is probably my go to album for a late night eyes shut meditative journey. It’s quite freeform and at the same time, recogniseably bluesy. Like all great music, I consider words completely unequal to the task of describing it. Truly ineffable. *Substitute ‘Leicester’ for your town/venue/stadium of choice. As it happens, hardly anyone comes to Leicester for to do anything like that. The nearest we had was Kasabian playing at Viccy Park last year – the sound was so good I could hear it in my back garden. I didn’t hear them ask the audience if they wanted to meditate, though. Nor if they wanted to rrroooocccckkk!